After NASA’s New Horizons zipped past Pluto on July 14, 2015, mission planners sent the spacecraft on a trajectory towards 2014 MU69, a distant trans-Neptunian object (TNO). Aside from its location in the Kuiper Belt and a distinctly reddish hue, virtually nothing was known about the object, which was first spotted by the Hubble Space Telescope just five years ago. New Horizons quickly flew past MU69 on New Year’s Day 2019 at speeds approaching 53,000 km/hr (almost 33,000 mph) and at a minimum distance of 3,500 kilometers (2,200 miles). In the days that followed the flyby, and as the photos of the close encounter slowly trickled back to Earth, it quickly became evident that NASA struck scientific gold by choosing to visit this particular TNO. Yesterday, at the 50th Lunar and Planetary Science Conference in The Woodlands, Texas, New Horizons scientists gathered to discuss the latest findings, addressing such topics as the object’s shape, geology, and composition, and to discuss new ideas about its formation. Indeed, MU69, which is located 6.6 billion kilometers (4.4 billion miles) from Earth, is unlike anything we’ve ever seen before. Its strange shape is forcing a major rethink about distant TNOs and how Solar System planets formed from smaller bits of dust and rock. MU69 is like a time machine, providing an unprecedented glimpse into our Solar System’s early history—the phase when planets were forming from building blocks known as planetesimals. Research presented by William McKinnon, a New Horizons team member from Washington University in St. Louis, described MU69 as a “pristine” Kuiper Belt object with a NASA press release adding that the object is an “unquestionably primordial contact binary.” Measuring around 35 kilometers (22 miles) long, the object consists of two distinctive sections: a large lobe called Ultima and a smaller lobe called Thule in homage to the rock’s somewhat controversial nickname. After the first few images came in, the New Horizons team reasonably assumed the lobes were ball-shaped, but subsequent images pointed to a more flattened disposition. A possible theory about MU69's formation is that two TNOs became locked in a slow orbit around each other, eventually touching in a gentle first kiss that left each of them remarkably intact. Mathematical models produced by McKinnon’s team suggests the two objects were moving no faster than a few meters per second—a slow jog. Over time, this intimacy grew, forming a contact binary in which the two objects became one. A new geologic map of Ultima Thule, showing how the two lobes are comprised of smaller components. A related possibility is that the lobes themselves were once comprised of small and medium sized rocks. These rocks slowly snapped into place like a gigantic jigsaw puzzle, forming a rotating disk. At yesterday’s meeting, NASA planetary scientist Jeff Moore said this rotation could have caused the lobe to flatten, and the spinning can explain “why we have the hamburger shape,” he said, according to Science News. The mechanics behind this celestial formation process are now an important avenue of study. New Horizons scientists are searching for signs of this initial kiss on the surface. One possible clue might be found on the “neck” or “collar” section connecting the two lobes together. The neck, as the NASA press release pointed out, appears warped—a sign of potential shearing forces as the two lobes slowly moulded into one another. Odd bright spots and dark zones on Ultima Thule. Other research presented yesterday addressed enigmatic surface features, such as bright spots and lines, including a bright streak seen along the neck, and some unusually dark zones. Mission scientists are also looking at various hills, craters, and pits seen on the TNO. The largest hole on MU69, dubbed Maryland, measures 8 kilometers (5 miles) wide, the cause of which isn’t known. It may be an impact crater or a pit crater—a geological formation caused by material sinking through cracks, or through the processes of sublimation, where ice transforms directly into gas. 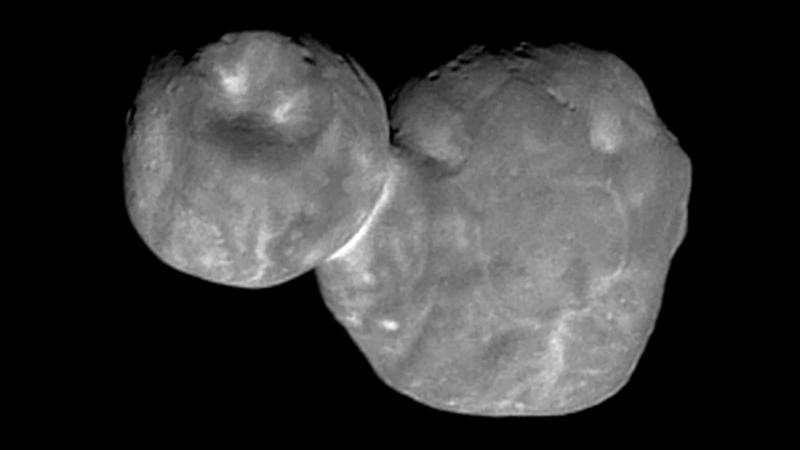 A color view of Ultima Thule showing its true reddish hue. As previous Hubble data suggested, MU69 has a reddish complexion. But the New Horizons flyby showed it was even redder than Pluto. At the meeting yesterday, the researchers also said they detected possible signs of methanol, water ice, and organic molecules on the surface, though more observations are needed to be sure. On that note, the large amount of data collected by New Horizons during the Ultima Thule flyby continues to trickle down to Earth in a process that will last until late summer 2020. That means there’s still plenty of data to study and new surprises may still await. 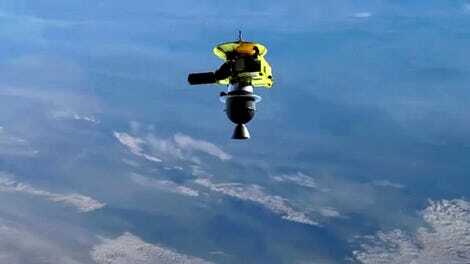 For now, we should be grateful the spacecraft flew past such an extraordinary object—one that’s sending planetary scientists back to the drawing board. Correction: A previous version of this article included an incorrect conversion of kilometers to miles. We regret the error.